Please enjoy the newest short from I.C.U.P.P. after the jump. I.C.U.P.P. is my collaboration with Brett Jackson. We create idea to internet in 6 hours. Special thanks to Dave Taylor and Kevin Brennan. A video I helped produce in the desert this summer for Betty Black. Part of the shoot took place in this motel with theme rooms where we found a crack pipe in the Cadillac bed. I love this song. Enjoy the video after the break. Check out more of Betty Black’s music at this link. “Hold My Coat” is the newest video from I.C.U.P.P. My collaboration with Brett Jackson, I.C.U.P.P., has produced another comedy short called “Hold My Coat.” We shot this on location at the 2014 Youtopia Festival in San Diego. Thank you to everyone at the festival who participated and to Todd Westphal for the camera work. If you like this, please give it a “like” and pass it on to your friends. You can see the full video after the jump. I was very excited to be able to hang all three owl pieces together last weekend at the Youtopia Festival in San Diego. I’ve been dreaming of a time when they would all be together in the trees and that dream finally came true. A big thank you to the art staff at Youtopia who awarded me my first art grant and to my artist Nino Alicea who helped me to hang the pieces in the trees (by climbing them). You can see a bunch of awesome pictures after the jump. Brett Jackson and I create content from idea to internet in under 6 hours. The collaboration, I.C.U.P.P. or International Comedy Union Professionals Partnership, has released our newest comedy short, “Hi, Mom!” You can see the full video after the jump. If you think this is funny, give us a like and pass it on to a friend. “Stephanie’s Parents” is a new short starring the amazing Bryan Irzyk, directed by Nicholas Snell and DP, Cooper James. See the video after the jump. “50 Shades of Grey – Official UK Trailer” is a new comedy short I co-wrote with Todd Westphal. You can see the full video after the jump. New comedy short from my new sketch duo – I.C.U.P.P. A new comedy short from I.C.U.P.P. (Me and Brett Jackson), “Where Do Ideas Come From?” If you like this video, please “Like” it and share with a friend. If you don’t like this video, please “Like” and forward onto an enemy. See the full video after the jump. My short film “Olive and Mocha” won the first ever FunnyorDie comedy competition through the LA Film Festival, Make ’em Laff. Suzi Yoonessi and I are very excited for the opportunity to produce a second short with FunnyorDie as prize for winning. KPCC interviewed Suzi for “Take Two” wherein she speaks about winning, breaking into the comedy world and not having kids. You can see the full article and listen to her interview after the jump. 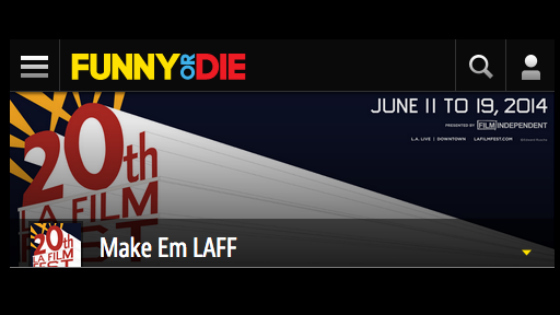 I’m pleased as punch to say that my short “Olive and Mocha: Fast Times At Sugar High” made it into the top 5 in FunnyorDie’s Make ‘Em Laugh film competition. They’ll be showing my short at the Grammy Museum on Saturday, June 14 @ 8:00pm. You can purchase tickets after the jump. So, that’s awesome. This year I produced a magnificent piece, “3 Owls” in collaboration with the artist Nino Alicea for the burn. This work of art is 26 feet long and hung off of a moving truck. You can see more pics after the jump. On August 14, I was honored to have my second short screened as part of the infamous Flux Series at the Hammer Museum in Los Angeles, California. Curated by Jonathan and Meg Wells, the night showcases filmmakers from all over the world. We were in good company and for the presentation segment of the evening, co-writer Bryan Irzyk and I performed an original sketch as the stars of the short, Lynn and Jack Hands. Please enjoy this short video I wrote and produced with comedy genius, Bryan Irzyk. Directed by the amazing Barry J. Holmes. If you think this is funny, give it a “like” and pass it on! See the video after the jump. “You Are What You Eat” Successfully funded on Kickstarter! The kids show I wrote for “You Are What You Eat” was successfully funded on Kickstarter! Congrats to Matt Danciger and Mel Metcalfe. Can’t wait to see season 1! “Rent-A-Rican: Blowout Sale” on Huffington Post! A short I co-wrote got featured on the Huffington Post! You can read the entire article after the jump. The kids’ show I wrote for, “You Are What You Eat” is raising money via Kickstarter to fund its first season. This show does a great job of mixing humor and lessons, nutrition and playing with your food, music and visuals. If we teach our youth how to eat well now, they’ll live better later. Any little bit helps. Produced by Switch Studios. See the sizzle reel after the jump. THANKS! Enjoy this comedy short I co-wrote with Nino Alicea. You can see the full video after the jump.